Honda Motorcycle and Scooter India (HMSI) has raced past Bajaj Auto to become the second biggest bike seller in India during the first half of the ongoing fiscal. During the April-September period this fiscal, HMSI sold a total of 10,48,143 motorcycles in the domestic market registering a growth of 19.8 per cent. On the other hand, Bajaj Auto sold 10,10,559 units witnessing a decline of 10.45 per cent, according to the latest data from Society of Indian Automobile Manufacturers (SIAM). In the comparable period last fiscal, HMSI sold 8,74,852 units as against Bajaj Auto's 11,28,425 units. Market leader Hero MotoCorp continued its hold on the segment selling 33,44,292 units in the first half of the fiscal as against 30,34,504 units in the year-ago period, a growth of 10.2 per cent. However, in the scooters segment the company has lost its second spot to Chennai-based rival TVS Motor Co. Hero MotoCorp's scooter sales in the April-September period this fiscal stood at 4,43,321 units as against 4,48,321 units in the same period last fiscal, down 1.12 per cent. TVS Motor Co on the other hand sold 5,66,362 units as compared to 4,00,804 units in the corresponding period last year, a jump of 41.3 per cent. units in April-September period last fiscal. 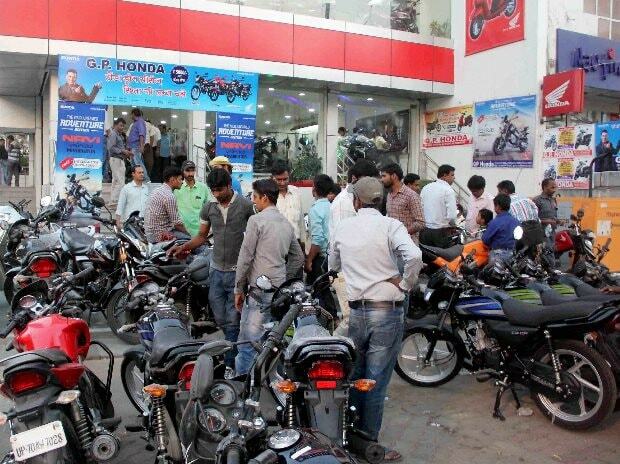 The other major gainer in the motorcycle segment was Royal Enfield, which sold a total of 3,78,304 units in the first half of FY18 as against 3,07,150 units in year-ago period, up 23.17 per cent. In the scooters segment, Suzuki Motorcycle India Pvt Ltd was a major gainer, selling 2,02,771 units as against 1,25,318 units in the corresponding period last fiscal, up 61.8 per cent, as per SIAM data. It is now the fifth biggest player in the segment after India Yamaha Motors which sold 2,26,249 scooters during the period as against 2,38,241 units in the year-ago period, down 5 per cent.